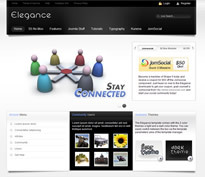 Shape 5 have released a new theme for September that works with Jomsocial and Kunena. Basically, it comes ready themes when you install these extensions. As a member of Shape5 you will also get a special $50 off Jomsocial if you decide to implement the system, so if only for that, it's not such a bad deal. The theme also comes bundled with all the goodies you expect to get from Shape5 as well as 23 module positions, four menu systems, fully collapsible module positions and lots more.